Recently an Alert Reader commented on the article “Fair Tax basics” on this site. The reader noted in part that the “Fairtax sounds great but check out the fine print http://fairtaxfineprint.blogspot.com/.” The link is to a blog critical of the notion that the Fair Tax will also tax governments. The text of the Fair Tax bill does confirm that the definition of the word “person” does include governments, which means that local, state, and even the federal government will be taxed if the Fair Tax becomes law. This is counter-intuitive. It seems nonsensical that the government will be forced to pay a consumption tax to itself. Only people pay taxes. Corporations and governments have no money that they don’t get from people, so when a corporation or government is taxed, the money it uses to pay that tax comes from real people. In the case of the government, it comes from taxpayers. Therefore, it seems that the Fair Tax would merely shift the tax burden to local and state governments as they increased taxes to pay the Fair Tax. To get an answer to this question, the Atlanta Conservative Examiner called the expert. Neal Boortz is the coauthor of two Fair Tax books and host of the Neal Boortz Show, a syndicated radio talk show based on Atlanta’s WSB AM-750 on Tuesday, April 12. Boortz pointed out that the problem with the Fine Print blog’s argument is that the government already pays taxes. Governments directly pay sales taxes on goods and services that they buy as well as Social Security and Medicare taxes on payroll. There are also indirectly pay embedded taxes on the goods and services that governments buy. These include payroll taxes of the workers that make the product being purchased. The Fair Tax would eliminate many of these taxes that governments already pay indirectly (although not the sales taxes levied by local and state governments). By specifically and directly taxing governments, the Fair Tax simply takes the money that governments have paid indirectly in the past and makes it a direct payment. Theoretically at least, the change is a wash. Because prices of goods and services would fall without embedded taxes, the total paid out should remain approximately the same with the Fair Tax making up the difference. Additionally, Boortz stated that he was working on a position paper to answer the charges from the Fine Print blog. A second objection to the Fair Tax it is simply a sales tax that would cause prices to rise by 23%. This does not consider the fact that the Fair Tax replaces other federal taxes. As those embedded taxes are removed, the price of goods and services should fall to an equilibrium point. The Fair Tax would be added to the lower price so that the actual final price paid on new items would be approximately the same as it is today. Used items would not be taxed and would therefore be cheaper than they are today. The critics who claim that the Fair Tax would raise current prices by 23% more accurately describe the Value Added Tax proposed by some Democrats. A VAT is a European-style consumption tax in which a tax is added at each stage of production of a good. Unlike the Fair Tax, a VAT would be in addition to current taxes. There is also some dispute over the actual Fair Tax rate. The answer depends on how the rate is figured. Depending on whether the rate is being quoted as tax-inclusive or tax exclusive, the rate can be as high as 30%. The amount of the tax is the same regardless of the percentage of the rate. The Fair Tax website acknowledges that the rate charged at the point of sale would be 30%. For example given on the site, if a person bought an item for $77, they would pay $23 of tax for a total of $100 ($77 x 1.3). The tax-inclusive price is $100.10. When figured the other way, the rate is different. If one begins at the total price of $100 and multiplies by 23 percent, the result is $23 of tax and $77 for the product. The tax-exclusive price is $77. This is akin to how income tax rates are quoted. Proponents of the Fair Tax say they use the tax-exclusive rate because the Fair Tax would replace the income tax. Critics say that the lower rate is misleading. In either example, the tax is virtually the same. Factcheck.org reports that a Treasury Department comparison of the Fair Tax and income tax shows that the middle class would pay more. Factcheck’s own analysis shows that those earning less than $24,156 per year would benefit when all taxes replaced by the Fair Tax are considered. Further, Factcheck says that David Burton of Americans for Fair Taxation acknowledges that high earners would probably pay a smaller share while “probably those earning between $40[thousand] and $100,000” would pay a larger share. The important thing to remember here is that each American would control the amount of tax that they pay. Since the Fair Tax is only levied on new goods and services, a taxpayer can reduce their tax bill by buying fewer new products. If middle class consumption of new products decreases, that would make more money available for saving and investing as well. Fairtax.org claims that the Fair Tax would entice expatriate companies to return to the US, flooding the country with capital. The group claims that GDP would increase by more than 10 percent in the first year alone while the increasing money supply would keep interest rates low. Even the left-leaning Annenberg Factcheck.org’s analysis agrees that the size of the economy would grow by 5 to 7 percent, and possibly as much as 10 percent, over a period of time. A growing economy would lead more profits, higher wages, a better standard of living, and, ultimately, higher tax revenues. Could there be a Fair Tax and income tax? A last major challenge to the Fair Tax is the charge that it will not be possible to pass. To ensure that the country does not end up with a sales tax and income tax, the Fair Tax would be passed along with an amendment to the Constitution that repeals the 16th amendment, which established the income tax. Needless to say, it is much easier to pass a law than a constitutional amendment, which requires approval by three-fourths of the states. The authors of the Fair Tax have written the repeal of the income tax, the payroll tax, the gift tax, and the estate tax into the bill. However, since the sixteenth amendment would have to be repealed separately, the possibility of having both an income tax and the Fair Tax remains a distinct possibility. This is especially true if the Democrats took control of the government, or of a majority of the states, after the Fair Tax is enacted. Thus far it has been difficult for the Fair Tax to gain traction in mainstream circles. With the current budgetary crisis, both parties can agree that major tax reform is needed. Unfortunately, there is little agreement on what sort of reform that should be. If it is difficult to enact the Fair Tax, it would likely be more so to repeal the constitutional income tax. Most support for the Fair Tax seems to be among conservatives and libertarians. Most independent voters are not aware of the Fair Tax. Those who know about it probably do not completely understand it. Even assuming the Republicans complete their takeover of Congress in 2012, it is unlikely that they will be able to muster the votes to pass the Fair Tax unless there is a major political realignment. Given the dire financial state of the federal government, the current crisis may spur that realignment. Currently, Georgia is a center for Fair Tax activism. The Fair Tax bill is sponsored in the House by Rep. 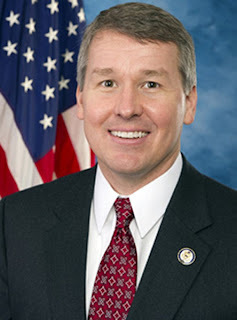 Rob Woodall (GA-7). He is joined by sixty cosponsors including Paul Broun (GA-10), Phil Gingrey (GA-11), Tom Graves (GA-9), Jack Kingston, (GA-1), Tom Price (GA-6), and Lynn Westmoreland (GA-3). Notably absent is Rep. Paul Ryan (R-WI), author of the Path to Prosperity. In the Senate, the bill is sponsored by Georgia’s Saxby Chambliss and has six cosponsors, including Georgia’s other senator, Johnny Isakson.